Cut out the strawberries and cut along the centre lines. Use the glue stick to make dots of glue all over the strawberries. Sprinkle the glitter over the top. Shake off any excess. Turn the strawberries over and repeat on the other side. Punch a small hole in the top of one of the strawberries. Slot the strawberries together and tape along the joins. 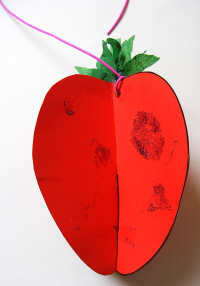 Cut leaves from the tissue paper and glue to the top of the strawberry. To finish tie a piece of cord through the hole at the top to hang your mobile.